I need help with this old portable pc. 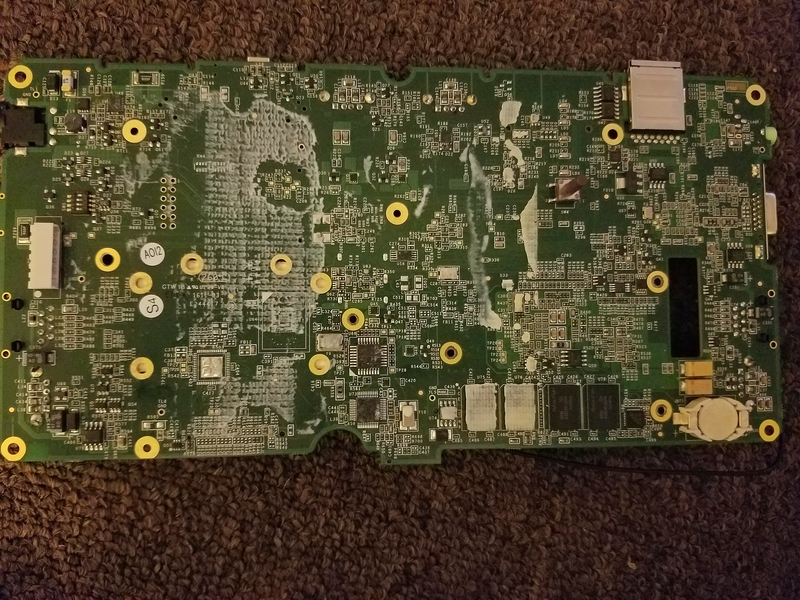 I have this portable pc I took apart, now I can't figure out where one important piece goes. The os is loaded on to a micro SD card, but the issue I'm having is that I don't see a "slot" where this card goes. When taking it apart, the card was towards the bottom middle area, and seemed as if it was just loose. The board is sideways, the bottom middle I'm referring, per the picture should be towards the middle left of the image. You're positive it's a Micro SD card? 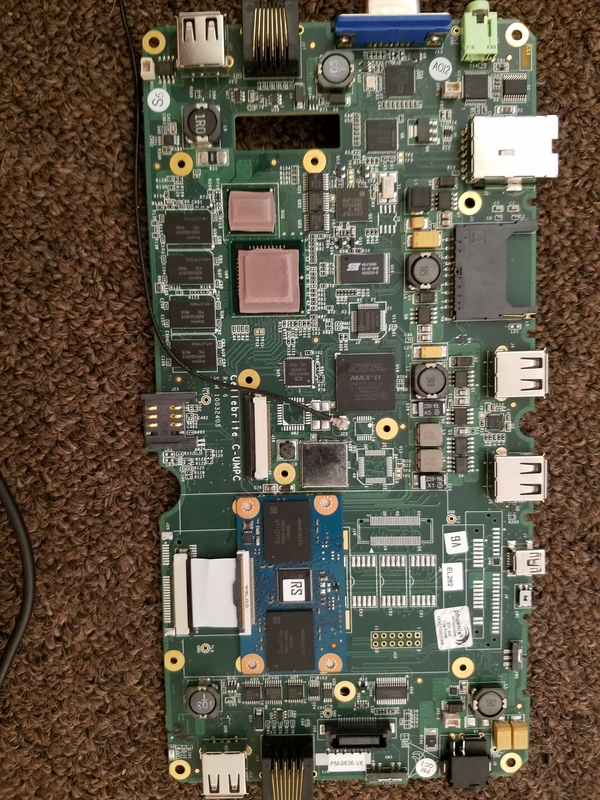 This board has some sort of mini/micro SIM card holder on the left, a full-size SD card slot on the right, and the blue board in the middle appears to be a solid-state hard drive. I put the device back together without the micro SD card and it wouldn't boot, just went directly to the bios instead. I loaded the sd card on the phone and it shows the file structure like on regular hard drives. The specs for the machine say 16gb ssd, and the sandisk 16gb is the only thing that was there that is 16gb. The SIM card slot is for just that, SIM card reading, the full size SD card is just a reader. There's 2 usb ports next to the full size SD card slot, but nothing was plugged in there when it operated normally. There's no floppy, disc drive or anything else to boot from, as far as what I can tell. Here's the belly of the beast. The white residue is from a black piece of tape? That protected (somewhat) the board from the battery. The battery was long gone when I got this device but worked fine plugged in. I think @drasnor is right. The 16 GB main memory you are looking for is in the two chips ("SanDisk ...8G") on the blue board. The original XP was probably running in a sort of kiosk mode. If you are trying to use it as a PC, with 1 GB RAM, you might get one of the small Linux distros working on it. All I've got is check underneath the SSD. That said, I don't think I've ever seen a card slot that wasn't edge-mounted because there's no way to load the card with components on all sides. I think I figured out why it won't boot. I don't know where I was looking but I damaged the connector cable from the board to the ssd. Micro sd waa just stuck inside the machine. I have another machine, both identical but I don't like using the other one because the other has an administraror account that I have been trying to disable. Would it be easier to get a replacement cable for the first machine? Or use one to fix the other? I would prefer to be able to use both but one cable is damaged now. One doesn't have an administrator account, the other does. I think I figured out why it won't boot. I don't know where I was looking but I damaged the connector cable from the board to the ssd... Would it be easier to get a replacement cable for the first machine? Or use one to fix the other? You can swap the cables, sure. Otherwise, have fun finding a replacement. Is there some type of software I'd be able to load on a usb drive to disable the administraror lock on the 2nd machine? I think I found a replacement cable for the first. I used a CD once to remove the admin lock from a computer I bought at a yard sale once, which had xp, but this little thing only has USB and Ethernet ports, and it's xp embedded, would that make a difference? 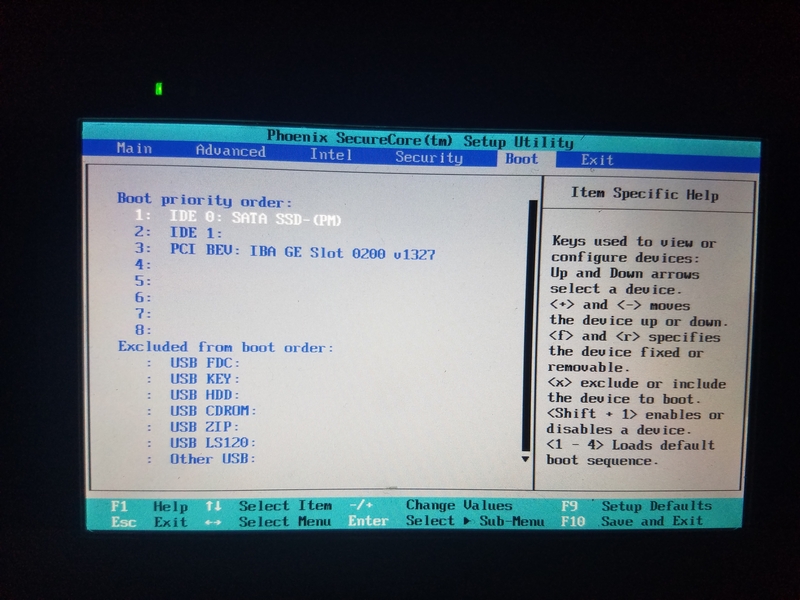 I have to plug a keyboard to get the machine to boot to the bios, would that let me boot from a usb so as to remove the admin lock? 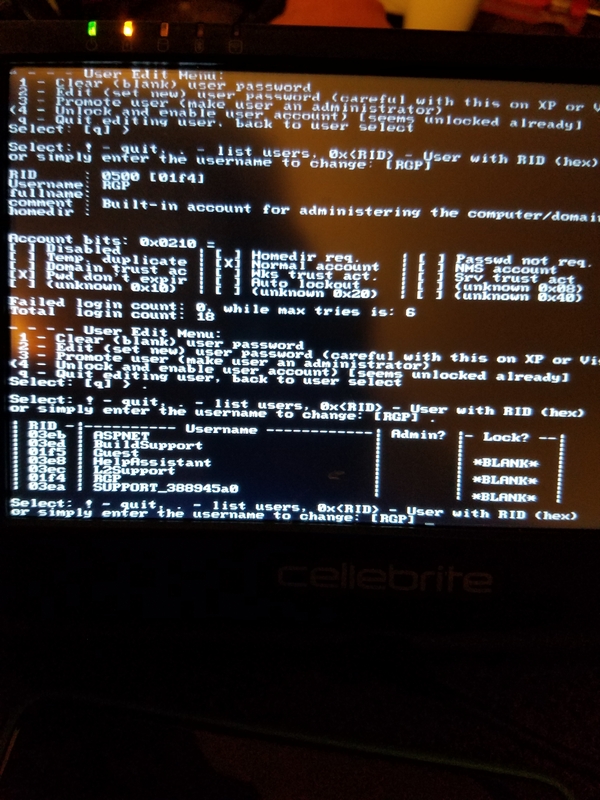 You can either find that password reset CD and use a USB CD-ROM (check your local Goodwill) or use the ISO with Rufus to make a bootable stick. BLANK under lock. I reboot, then it goes back to the same limited locked account. Is there a way i can get it to show the rest of the accounts, or at least un-restrict the username it defaults to when logging in? Try promoting the built-in account to administrator (option 3) or booting in safe mode to get the full users list. Would it make a difference which account i promote to administraror? I ask because the username the machine defaults to when it's logged in is not there, which is something like NARETAIL/BBY. I did boot into safe mode and when I press ctrl+alt+delete to try and change the user to any of the users listed above, it says I don't have permission. Booting in safe mode doesn't list the full user list, unless I'm doing something wrong, it just defaults to the same NARETAIL/BBY domain/account . The RGP username says it's built infor administering the domain/ computer but i don't have access to that account either. We're pretty far past the part where I would've taken @BlueTattoo 's advice and just installed Linux since Windows XP is several years past security patch termination and you can't run modern software or connect to the Internet without catching a virus. If you want to preserve the existing Windows install, try booting from a live Linux media such as Knoppix and saving the internal SSD disk image as a file on a USB stick using dd. That HOWTO assumes you're directly writing to another disk but I recommend just writing it out to a file since your disk is only 16 GB (the file will also be 16 GB). I would install Arch Linux for this combination of weird hardware and tiny hard disk but the price you pay for that is extensive manual configuration. Arch will be very difficult to install unless you are proficient with Linux and can isolate hardware foibles from user misconfiguration; you can count on having both kinds of issues with this platform. Regardless of your choice of distributions, I am not reasonably able to help you set up Linux on these devices. Feel free to tinker on your own and take advantage of the distribution's community support; just acknowledge that you're having fun and don't have a reasonable expectation of getting a working practical system out of it. Embedded hardware is notoriously hard to deal with unless there's a vibrant hacker community associated with the particular device you're fooling with.